Advanced technology tracks weight, lean mass, body fat percentage and BMI (body mass index). Stats and progress are displayed in easy-to-read charts on your Fitbit dashboard. With this smart scale, measurements go beyond body weight to give you a clearer view of your overall health. Aria 2 syncs with your Fitbit dashboard to display charts and graphs of your progress so you can stay on top of your health and keep pushing toward your goals. When you step on the scale, Aria recognizes who you are, displays your data, and sends your stats to your Fitbit account. Plus, it recognizes up to eight individual users. Progress has never looked so good. Designed with a sleek, polished glass surface, the Fitbit Aria 2 is made to look great in any home. The scale works with all Fitbit watches and wristbands so you can get a better understanding of how your activity impacts your weight. Use the Aria 2 Wi-Fi Smart Scale to automatically send weight stats to your dashboard, or log your numbers manually in the Fitbit app, to stay on track and see your trends over time. See your progress and analyze your trends with easy-to-read charts and graphs. Set weekly exercise goals to keep yourself accountable, and see summaries of your key workout stats. 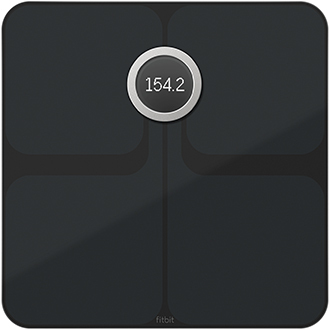 Learn how the Fitbit Aria 2 Wi-Fi Smart Scale gives you a clearer picture of your health.